Brother Ron Miller has been the pastor of Bethel Fellowship Church in McDaniels, Kentucky since 1980. Bethel is a New Testament church with a worldwide impact. He and his wife, Gretchen have been involved in numerous visions literally being built from the ground up. They raised their 3 children, plus several foster children on the campus of Bethel Fellowship, educating them with biblical standards. The ministry fought and won a court battle back in the early eighties to establish one of the first private Christian Schools in the state. In 1987 they began broadcasting a Christian radio station, WBFI, 91.5 fm, a mixture of Christian talk, music and family oriented programming. Brother Ron has become a familiar talk show host of the BBC, (Bible Breakfast Club) heard “live” every weekday morning. He reports the news from a biblical worldview and answers bible questions. He has also interviewed a wide variety of ministers, political figures and businessmen. His syndicated program, “The Sword and Shield” airs daily in the US and several foreign countries. In the year 2000, Brother Ron authored his first book, “Walking in the Covenant of Salt.” This is an ancient Hebrew covenant revealed to him in the scriptures concerning personal holiness. Not afraid to dive in deep, he also wrote “The Book of Balance” tackling the six most controversial issues in the body of Christ. 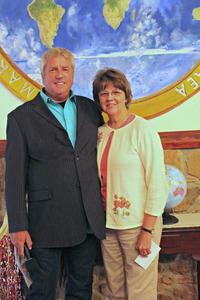 Pastor Ron continues preaching, teaching and working to Advance the Kingdom. His foot has landed on 33 nations spreading the gospel through mission work, planting and fathering churches and listening close to His voice for the next assignment.